This is somewhat of a classic dish in these parts, and super-simple: Fresh tomatoes meet an interestingly shaped baladi eggplant, and all of the above are in season right now. I favor taking advantage of the fact that tomatoes are in season, since bright red tomatoes, sweet and juicy, add something to a dish that no processed tomato product can do. Chop the eggplant into chunks, dice the onion and crush the garlic. 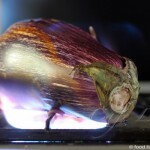 Let the onion begin to fry in some olive oil in a thick-bottomed pot, then add the garlic, and finally the eggplant. Add the optional carrot. Begin slicing the tomatoes into the pot, and add the water and spices. Close the lid and let simmer until the tomatoes are falling apart. 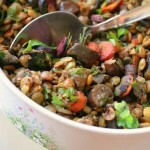 Serving suggestion: Top with freshly chopped parsley or cilantro. Eat hot or cold. 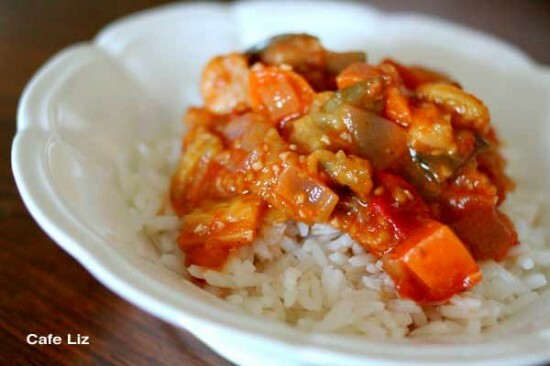 3 Responses to "Simple eggplant tomato stew"
This recipe looks great, but I am wondering how well the leftovers keep. Is it possible to freeze portions of this soup for later or will the eggplant basically lose all texture? Hey, unfortunately I can’t really tell you, since I don’t usually freeze leftovers. 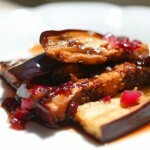 The eggplant is pretty mushy when this dish is cooked, if that helps.